This is an oil painting I completed in 2005. I tried to capture the wintery feel in the scene which I was observing. 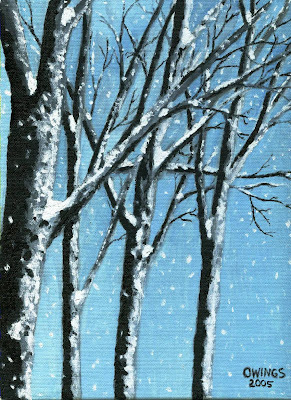 Snow clung to the trees like frosting on a cake while large flakes fell gently from the sky. The painting recently sold and afterward I felt a little sad to see it go. Although the painting is very simple in many ways, it still represents many hours of study and work. My mind was clearer then because I didn't think so hard about this technique or that. In some ways I was more free. In the end I was happy it went to a good home and hope it has interest for others. Reverand Jonathan & Mrs. Anne Zielski.